Thanks to the new ICX674 sensor with high quantum efficiency, the Atik 428EX camera offers a high sensitivity to allow you to take photographs of the fainter objects and to record the finer details. This sensor also has a very low noise which, together with Peltier cell cooling, allows to perform alsovery long images with the certainty of having a very high signal/noise ratio. The color model is less sensitive than the monochrome model but allows you to take pictures in color directly in a more simple and fast. The Atik 428EX is the first camera available to astronomers that uses Sony’s state of the art ICX674 2.8MP sensor. Featuring the latest generation EXview technology, this camera has an outstanding Quantum Efficiency, very low noise and excellent thermal management. This model is an ideal match to telescopes commonly used by amateurs. It’s excellent sensitivity makes it one of the best cameras for deep-sky astrophotography, surpassing its forerunner, the acclaimed ICX285. The Atik-4 Series cameras are a development of the 3-Series cameras, featuring better cooling and narrower body. They benefit from setpoint cooling to make taking matching dark frames a snap, and simple 12V power requirement to facilitate field operation. The impressive sensitivity, great cooling and narrow profile, make the Atik Series 4 outstanding CCD cameras to use on modern telescopes, including Hyperstar/Fastar systems. Choosing from various astrophotography camera for the deep-sky may seem complicated. 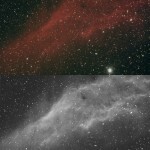 In this article, through a series of practical examples, we will see how to choose astrophotography camera to record also the weakest details of galaxies, nebulae and star clusters through with long exposures (these camera are different from those used for planetary and lunar photography that record short videos and which we will discuss in a later article). Astrophotography camera for the deep-sky are almost always cooled, ie have a system with Peltier cells which cools and stabilizes the sensor at a low temperature in order to reduce the noise of the image and therefore improve its quality.